A team of researchers has developed a new light-emitting fibre than could be woven into fabrics, providing flexible smart fabrics than can illuminate themselves. 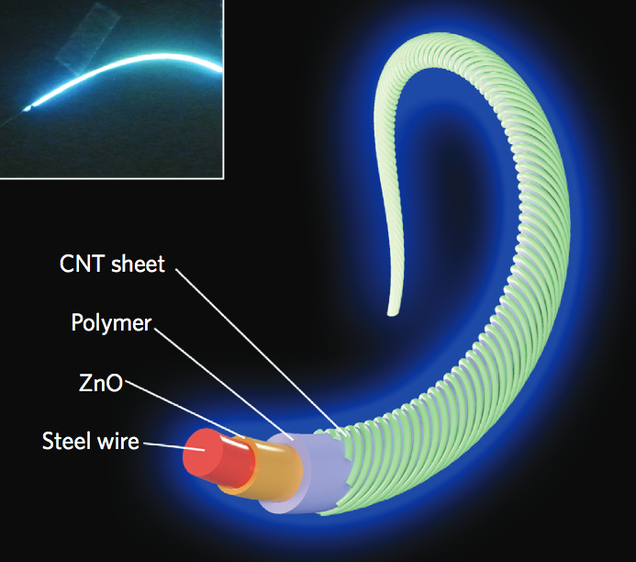 The fibres use a stainless steel wire core, which is coated with a thin layer of ZnO nanoparticles and then wrapped in electroluminescent polymer. Finally, a transparent coating of carbon nanotubes is applied. The resulting millimetre-diameter fibres are effectively long, thin polymer light-emitting electrochemical cells. In tests the devices worked for several hours, glowing either bright blue or yellow. But in theory these devices could last for thousands of hours—and yes, other colours should be possible, too. The light gets thrown out in all directions, so can be seen from any angle, and they also consume less power then conventional LEDs. The researchers claim that the fibres are lightweight and highly flexible, which means it should be possible to easily incorporate them into fabrics. Indeed, the team, from Fudan University in Shanghai, suggest that they could "be woven into light-emitting clothes for the creation of smart fabrics." This could be the fabric the 80s always needed.